The Verdict time & billing software family encompasses both single user standalone systems and multiuser networked systems. The software is easy to use and customizable, so whether you are a sole practitioner or a large multi-partner firm, Verdict can adapt to your specific requirements. Verdict makes it easy to capture all your billable time and produce timely, itemized billing statements and the reports you need to manage your practice. includes early approval as an advanced system (Verdict 6.0) by the American Bar Association's Legal Technology Advisory Council and accolades from secretaries and attorneys alike at thousands of law firms over a period of thirty years. 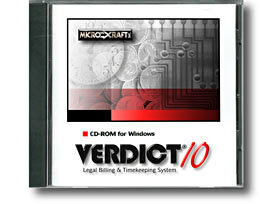 Our newest system, Verdict 10 for Windows 98 through Windows 10, is the product of over two decades of continuing development, working in partnership with thousands of law firms to produce a system that is powerful, flexible and superbly easy to use. Verdict 10's intuitive menu structure, robust 32-bit architecture, and unique features such client/account Search Trees and instantly sortable data continue to make it the standard in legal billing software. No matter which Verdict® system you choose, you'll quickly be producing itemized, ready-to-mail bills in a variety of formats. And you'll have the pre-bill review statements and management summaries and reports necessary to manage your practice.